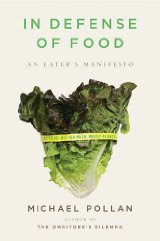 I just finished reading In Defense of Food by Michael Pollan. I read Omnivore's Dilemma last year and found it convicting. I was terribly out of touch with the origins of my food and ignorant to the extent of influence of the industrial food processors. His latest book, In Defense, is a smaller book and quick read, but the message is terribly important. We've attempted to reduce food to it's consitutent parts believing that reductionist science can tell the whole story -- that nutrition is merely the sum of its parts. We're turning our backs on a solid history of diverse eating that has generally worked well for centuries. One needs only to look at how a baby formula has never been created that is equal to breast milk. I marvel that man thinks he/she can know better than nature! The bottom line is that it's not this nutrient, that fat, this amino acid, that mineral that is the culprit or savior and the science that would have us believe that is generally flawed. The general state of declining health should be sufficient to support that. Pollan advises: Eat food, not too much, mostly plants. Eat food may seem strange, but little of what we find in the grocery store is food, but rather concoctions of chemicals created by food scientists to hold the greatest appeal.